any t ine since the earl,- mo:nt hs of 1''7. States -orts increased shirpT.l,- in 1To.-ember ani in December. Lambs, and Wcol is now available to readers of The Wool Situation. are still about 40 percent higher than before the sharp rise in September. Wool prices advanced at South African sales in December. at Boston are about 40 percent h'i,ht':-. than before the sharp rise in Sept ember. 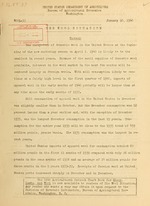 cents on December 15, 19 3.
in the 5 years 1933-37.
ception of the October-Uoc.': . !er consumption in 1935.
than the 11-month average for the 10'years 1928-37.
from April through November averaged about 6-1/2 miillion pounds a month. the first quarter of 1937 imports and mill consumption wore relatively large. on April 1, 1937 were larger than on April 1, 1936.
nc-t few months is likely to be~ contoied Ir.rc'.y on foreign wools. sumption in 1940 will bo somewhat smaller than in 1939.
sumption figures from the Bur iau of the Census. I/ U7- -hit as reported, greasy, scoured, and skin wool added together. ./ Bureau of the Census fi .-u'e adjustedd to 52-weok basis. estimate o2-ual to 1938 .pro luation of pulled wool. short lengths were about 22 percent higher on December ?5 than on November 17.
extent that prices shall not drop below those agreed upon in the price schedule. The actual schedule of prices has not been disclosed. A i !av. av. : Sept. : Nov. : Nov.: Dec. : Dec.
Prices converted from South African pence to cents at current rates of exchange. October and November, sales were resumed on a moderate scale in December. according to a cable from the American Legation at Montevideo. of November became of delayed shearing. the outbreak of the European War. SMil. lb. Mil. lb. Mil. lb. Mil. lb. Mil. lb. magnitude nnd carried on in so many different parts of the world. bottoms avcil.cb'!Tc early in the New Year. generally familiar to the trade. at December rate of exchange for British pound). who are },r-idlinr- the clip. calculating the c.i.f. basis Boston (excluding war insurance). b.-sirn the comnutartion on an approximate equivalent of c.i.f. ''h"s/70s leaning to 70s, combing super style, j9 . "''s/66s, super spinners half warp, 375Ad. or good topmaking, free or nearly free, 33d. good make and color, 31d. he would like to have brought before the proper authorities." m 1937 : 1938 : 1937 : Dec. : Oct. : Nov. : Dec.
1/ Scoured basis, Boston market. 2/ Average at 10 markets. -/ White 13-15 denier, at New York, Bureau of Labor Statistics. 4/ Domestic yarn, first quality, Bureau of Labor Statistics. Imports for consujr,-ti-:r.: i-. : 'und. Finer than 40s ......: .1 -.,71. 141 : O .ct. N.ov. Mi.chine ry ?t i-'_, : . machinery activit- rt:ni. th:- Pure?.u f the :'-rluz. 1/ Weight of gre.-: :-our.,,, and skin wc.l ai. ed tc.feth'er. November, 48 weeks: 1..-V: t. : z.. -d .-. :-. ",.- B d-. ': 1: .diu tmerr t .r:de for holidays.